Here at Sarasota Landscaping Services, we believe landscape lighting can help enhance your property both from an appearance standpoint, and from a security standpoint; however, there are many do’s and don'ts when it comes to lighting installations. HOA boards and commercial property owners alike looking to improve their properties want to select the right types of lighting and place them appropriately throughout the landscape. Get it right, and you have an elegantly lit neighborhood that is appealing for visitors and residents; get it wrong, and you either have what looks like the overly lit interior of a football stadium or the shadowy setting for a horror film. It's important to understand that a well-lit outdoor garden adds value to the home and in turn can also boost your curb appeal. Imagine this: you’re at your home on a Saturday night and you’ve invited some friends over. They’ve never been to your home before, so you’re hoping to make a good impression. 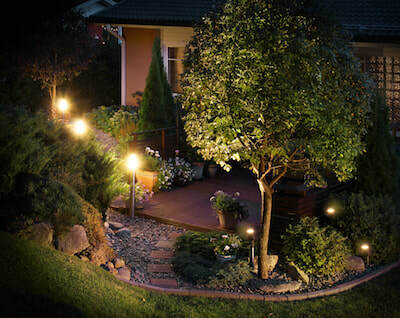 When you realize it’s a nice night outside, you decide you’d like to move the entertaining area outdoors—and to do so, you’ll need some excellent landscape lighting. Not only will your friends get to gaze out into your yard to admire your landscaping, but they’ll also be impressed that your commitment to safety with the additional of outdoor lighting. If you ever find yourself in this situation and realize that you don’t have any landscape lighting to impress your guests, then you know who to call. As one of the leading landscaping companies in Sarasota, we know that is typically an increase in interest for landscape lighting around spring to early summer. Of course, this makes sense—homeowners want to enjoy your landscaping and hardscaping both during the day and night. 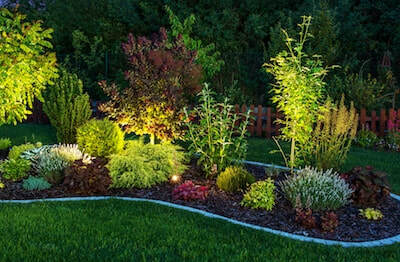 While landscape lighting is beautiful, it doesn’t come without it’s challenge. The number one challenge? Installation. Our professionals are trained and experienced in both the steps and tools needed to successfully install lights throughout your yard, but that doesn’t mean it’s a simple job. We never suggest that homeowners or even business owners attempt DIY-installation on their own. There are many factors to consider, and in the end it should be left to our trained experts. Not to mention, if you attempt self-installation and you neglect to consider existing landscapes or hardscapes in the placement of lighting, you run the risk of creating shadows or hard glares. The goal of landscape lighting is to enhance visibility, so if you're accidentally inhibiting it by placing the light in a place where the cast light will be blocked or will create a blinding glare, you have a problem. Visitors and residents to a neighborhood or place of business want to feel they can see everything around them at night. This creates a sense of comfort and trust. Of course, every landscape is different, which is why it's not possible to make specific recommendations without examining a landscape's needs. When you're ready to install lighting in your landscape, consult with our team—we know the ins and outs (or dos and don'ts) of landscape lighting in Sarasota, FL.